On November 5-8, 2018, the Department of the Interior conducted the most recent High-Flow Experimental release from Glen Canyon Dam. The HFE release included a peak flow of approximately 38,100 cubic feet per second for 60 hours (four days including ramping from baseflows to peak release) to move accumulated sediment downstream to help rebuild beaches and sandbars. This HFE release was the first to be conducted under the 2016 Long-Term Experimental and Management Plan HFE Protocol. Similar HFE releases were conducted in 2012, 2013, 2014 and 2016 in accordance with the 2011 HFE Environmental Assessment Protocol. The 2018 HFE release provided resource benefits and scientific information to be used in future decision making. HFE releases are triggered based on sediment accumulation in the Colorado River. They are generally driven by storm activity resulting in floods in the Paria River that move sediment over time into the Colorado River. In 2020, per the 2016 LTEMP, HFE releases could occur within two timeframes: in the spring from March through April and in the fall from October through November. Due to regional weather patterns and other factors, fall HFE releases are expected to be triggered more frequently than those in the spring. An accounting period for Paria River sediment inputs was determined in the LTEMP; if enough sediment enters the Colorado River from July-November, a fall HFE release may be planned and conducted. Due to logistical and operational constraints, the decision to conduct a fall HFE release is usually made in October rather than at the end of the accounting period. Therefore, Reclamation will determine if a 2020 HFE release will occur that spring or fall when sediment input to the Colorado River is sufficient to justify the experimental flow. Nov. 5 - 11:00 a.m. open bypass tubes, reach full bypass at 2:00 p.m.
4,000 cfs/hr until Power Plant Capacity (PPC) and then 4000 cfs/hr until peak. 4,000 cfs/hr until 15,000 cfs release, then 1,500 cfs/hr until Power Plant Capacity (PPC) and then ~1,850 cfs/3 hr until peak. 1,500 cfs/hr until Power Plant Capacity (PPC) and then 1,875 cfs/3 hr until peak. 1,500 cfs/hr until Power Plant Capacity (PPC) and then 1,500 cfs/hr until peak. 4,000 cfs/hr until Power Plant Capacity (PPC) and then 2,000 cfs/hr until peak. 4,000 cfs/hr until Power Plant Capacity (PPC) and half-bypass tube ~1,875 cfs/hr until peak. 4,000 cfs/hr until Power Plant Capacity (PPC). 1,500 to PPC; 1,000 to 20,000 cfs/hr total release, then 500 cfs/hr until base flow of 8,000 cfs/hr was reached 1,500 cfs/hr to PPC and then 1500 cfs/hr to normal operations. 1,500 cfs/hr to PPC and then 1,500 cfs/hr to normal operations. 200 cfs/hr to 27,500 total release and then 1,000 cfs/hr to PPC then 1,500 cfs to normal operations. 1,500 cfs/hr to normal operations. 1,500 cfs/hr to normal operations. 1,500 cfs/hr to normal operations. 8,000 cfs steady before and after. 8,000 cfs steady before and after. Between 7,000 to 15,000 cfs before, 7,000 cfs to 13,000 cfs after. Between 7,000 cfs and 9,000 cfs before and after. Between 5,000 cfs and 8,000 cfs before and after. Between 7,000 cfs and 9,000 cfs before and after. Between 6,500 cfs and 9,000 cfs before and after. Q: What is the purpose of high flow experimental releases? A: When the Glen Canyon Dam was built, it blocked over 90 percent of the sand or sediment that flowed down the Colorado River through the Grand Canyon. It changed the red, sediment-laden river to a clear cold river. Most of the sediment still available below the dam comes from two tributaries, the Paria River and the Little Colorado River. The purpose of high flow experimental releases, or HFEs, is to mobilize the sand in the river with high-volume water releases from the dam and redeposit it downstream as sandbars and beaches along the Colorado River in Glen Canyon National Recreation Area and Grand Canyon National Park. These sandbars serve as camping beaches for recreationists, supply sand to protect archaeological sites, and provide habitat for wildlife. Q: Why are high flow experimental releases necessary? A: High-flow experimental releases are designed to simulate flooding of the Colorado River through Glen and Grand canyons that occurred prior to the construction and operation of Glen Canyon Dam. Nearly all the natural sediment load once transported by these floods is now trapped in Lake Powell behind the dam resulting in the loss of downstream sandbars, beaches, and associated resources along the Colorado River corridor in Grand Canyon National Park and Glen Canyon National Recreation Area. Episodic floods in tributaries downstream from the dam, such as the Paria River, are critical sources of sand input. High flow experimental releases, when conducted under sediment rich conditions, have demonstrated benefits to downstream sediment resources. Q: What is the long-term plan for conducting high flow experimental releases? A: High flow experiments are conducted under the Long-Term Experimental and Management Plan (LTEMP). Under this long-term plan, HFEs are tested during sediment-enriched conditions to determine whether and how high flow releases can be used to better build sandbars and conserve sand over a long period of time. HFEs following tributary deposits of new sand into the main channel of the Colorado River are the only known tool for building sandbars. However, sandbars tend to erode in the weeks and months after an HFE, so it is necessary to do HFEs repeatedly to maintain the benefits over time. The LTEMP was developed by the Department of the Interior through a public process pursuant to the National Environmental Policy Act and is based on the best available scientific information developed through the Glen Canyon Dam Adaptive Management Program and other sources of relevant information. The 2018 fall HFE will be the first conducted under the 2016 LTEMP and will build on the extensive research and learning from previous high flow experiments. Q: What scientific information are high flow experiments based on? A: There is more than 20 years of extensive scientific research, experimentation, and analysis conducted under the Glen Canyon Dam Adaptive Management Program, including analysis of a series of previous high flow experimental releases, particularly those conducted in 1996, 2004, 2008, 2012, 2013 2014, and 2016. This wealth of scientific information is used to inform and refine future decisions regarding the operation of Glen Canyon Dam and management of the Colorado River. Q: What is the LTEMP? Q: Does an HFE change the total amount of water released from the dam for the water year? A: No. The HFE will not impact the total annual amount of water released from Lake Powell to Lake Mead in the water year. Releases, both before and after the November experiment and throughout the remainder of the water year, will be adjusted to compensate for the higher volume released during this high flow experiment. The additional water released as part of an HFE is part of the total annual water released from Glen Canyon Dam (Lake Powell) determined in August of every year based on the projected hydrology and forecasted reservoir elevations identified in the Bureau of Reclamation’s August 24-Month Study. High flow experimental release flows are included in that total annual volume and are offset by adjustments to the monthly release volumes during other months of the water year. The August 24-Month Study established the operating tier for Water Year (WY) 2019 as the Upper Elevation Balancing Tier. As described in the Interim Guidelines, under balancing operations, the contents of Lakes Powell and Mead are to be balanced by the end of the water year, but not more than 9.0 million acre feet (maf) and not less than 8.23 maf is to be released from Lake Powell. Based on the October 24-Month Study, an April adjustment to balancing releases is anticipated and Lake Powell is currently projected to release 8.92 maf in WY2019. This projection will be updated each month throughout the water year. Q: What is the typical timing, duration and magnitude of these high flows? A: Under the LTEMP, sediment-triggered HFEs may occur in spring (March or April) or fall (October or November), with a magnitude range from 31,500 cfs to 45,000 cfs; however, under LTEMP, spring HFEs cannot occur until 2020. The duration of sediment-triggered HFEs will typically be from less than one hour up to 96 hours, with allowance for occasional fall Extended HFEs up to 250 hours in duration, depending on how much sediment is in the system and other resource conditions. Beginning in 2020, the LTEMP can also trigger proactive spring HFEs that will be tested only in years with projected high annual release volume (i.e., ≥10 maf) and when no sediment-triggered HFE occurs. Proactive HFEs may be made in spring or early summer (April, May or June), and will have a duration range up to 24 hours. The frequency of HFEs is determined by tributary sediment inputs, annual release volumes, resource conditions, and the decision process carried out by the Department of the Interior (DOI). There are typically more fall HFEs than spring HFEs because more sediment is available in the late summer and fall from the Paria River as a result of monsoon storms. Q: Is there environmental compliance for the 2018 HFE? Q: How are decisions made under the LTEMP for conducting high flow experiments? Hydrology and sand budget modeling – to evaluate the available volume of water and sand primarily delivered by the Paria River, and determine the magnitude and duration of a potential HFE. Decision and implementation – Scientists and resource managers make a recommendation to the Department of the Interior Assistant Secretary for Water and Science based on the suitability of the hydrology, sediment, and other resource conditions. If approved, the HFE is coordinated and implemented by Department of the Interior and Department of Energy partner agencies. Q: What impact will high flow experimental releases have on the level of Lake Powell given the dry conditions in the basin? A: Over the course of the year, there will be no change to the elevation level of Lake Powell as a result of the HFE. This is because the water released from the reservoir during an HFE does not change the total amount of water released over the course of the water year (October through September). Because the additional water released during an HFE is included within the total annual release volume, these releases are made up for through adjustments made to the monthly release volumes during other months of the water year. Q: What is the current status of the endangered humpback chub below Glen Canyon Dam? A: The area near the confluence of the Colorado and Little Colorado rivers is occupied by a large portion of the humpback chub population in Grand Canyon, and nearshore areas in this part of Grand Canyon are used as nursery habitat by young humpback chub. The population in Grand Canyon is currently the largest since the dam’s creation and the status of this population has significantly improved since the mid-to- late 1990s. The research and monitoring elements of the proposed action are intended to facilitate and enhance this upward trend in population status. Current U.S. Geological Survey estimates for humpback chub in Grand Canyon show that the number of humpback chub below Glen Canyon Dam is approximately 12,000 fish. Other monitoring information also indicates humpback chub status has been improving for nearly 20 years. 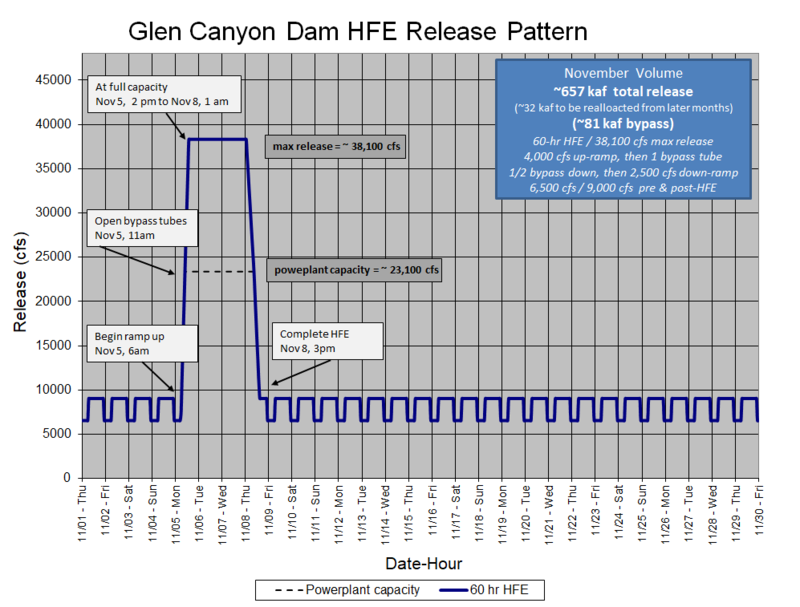 Q: How will the HFE impact hydropower generation at Glen Canyon Dam? A: During a high flow release, water goes through both the hydropower units (turbines) and through the bypass tubes. Some water generates power and some water bypasses the power generation. During an HFE, additional power is produced, but later in the year the water that was bypassed is not available to generate power. As a result, additional power will need to be purchased at that time from other energy sources such as coal, natural gas, or renewable energy. The estimated financial costs to Western Area Power Administration as a result of implementing the 2018 Fall HFE is approximately $920,000. The implementation of HFEs under LTEMP has not created a long term need for new or alternative energy supplies. The LTEMP HFE decision making process includes appropriate review and planning for all resources, including coordination with the Western Area Power Administration on specific changes to power generation associated with each HFE to ensure a steady supply of power. Q: Who are the federal agencies involved in these activities and what are their roles and responsibilities? A: A total of five Department of the Interior agencies and one U.S. Department of Energy agency have responsibilities under the Grand Canyon Protection Act, and undertake operations pursuant to the act: Bureau of Reclamation, National Park Service, U.S. Fish and Wildlife Service, Bureau of Indian Affairs, and U.S. Geological Survey, as well as Western Area Power Administration. These agencies work together to ensure the effective and coordinated implementation of the adaptive management and research activities of the LTEMP. The Department of the Interior has multiple responsibilities on the Colorado River, including meeting water delivery obligations, protecting and improving downstream park resources for future generations, conserving fish and wildlife species, providing recreational opportunities, conducting research and monitoring in support of the Grand Canyon Protection Act mandates, carrying out the trust responsibility to Indian Tribes and consulting with the Tribes on matters of importance to them, and ensuring the generation of clean hydropower. Bureau of Indian Affairs: The BIA’s Western Regional Office works hand-in-hand with interested tribes and other participating agencies as part of the Glen Canyon Dam Adaptive Management Program to ensure the fragile, unique, and traditionally important landscape is preserved and protected. Bureau of Reclamation: Responsible for operating Glen Canyon Dam in accordance with applicable federal law, records of decision, operating criteria, and the additional criteria and operating plans specified in Section 1804 of the Grand Canyon Protection Act, as well as in accordance with approved experimental plans. National Park Service: Responsible for the protection and management of national park system units and administration of resource-related programs under the authority of various federal statutes, regulations, and executive orders, and in accordance with written policies set forth by the Secretary and Director of the NPS. U.S. Fish and Wildlife Service: Provides Endangered Species Act conservation and associated consultation and recovery leadership with various agencies, tribes, and stakeholders primarily to benefit five ESA-listed species in Grand Canyon: humpback chub, razorback sucker, southwestern willow flycatcher, Kanab ambersnail, and California condor. U.S. Geological Survey: The Grand Canyon Monitoring and Research Center (GCMRC) of the U.S. Geological Survey (USGS) was created to fulfill the mandate in the Grand Canyon Protection Act for the establishment and implementation of a long-term monitoring and research program for natural, cultural, and recreation resources in Grand Canyon National Park and Glen Canyon National Recreation Area. Grand Canyon Monitoring and Research Center provides independent, policy-neutral, scientific information to the GCDAMP. Department of Energy - Western Area Power Administration: Markets power from the Colorado River Storage Project (and its participating projects) at wholesale to utilities that provide retail electric service to over five million consumers in the CRSP region. Q: What kind of scientific monitoring will happen following the release? A: GCMRC will be conducting the following monitoring activities to determine the effects of the High Flow Experiment planned for November 2018 on physical and biological resources in the Colorado River Ecosystem downstream of Glen Canyon Dam. Scientists will monitor a number of resources throughout the canyon all the way down to Diamond Creek using a variety of different technologies. Some monitoring will be with remote cameras to take pictures of how beaches change, some will be done with staff from a boat to look at the concentration and composition of the sediment and other water quality factor in the river at various locations. They also will construct ‘sand budgets’ to show much sand is coming and going from various reaches. They post all this data and the photos to the GCMRC website some time after the HFE is conducted (http://www.gcmrc.gov). The response of the aquatic foodbase (so fish food in the river) will be monitored in Glen Canyon by sampling for aquatic insects and other invertebrates drifting downstream and throughout Grand Canyon using GCMRC's ongoing citizen science light trapping of aquatic insects (http://www.gcmrc.gov/research_areas/food_base/citizen_science_monitoring.aspx). GCMRC will also monitor the effects of the HFE on rainbow trout movement, growth, and survival in Glen Canyon. Several thousand rainbow trout will be captured, tagged, and released prior to the HFE. Following the event, crews will sample for these fish and use information from recaptured fish to determine how far they moved and in what direction, if they gained or lost weight, as well as estimate survival rates over the time interval that included the HFE. Q: What is the role of U.S. Geological Survey science in planning and implementing HFEs? A: USGS scientists, mainly at the Grand Canyon Monitoring and Research Center, are instrumental in designing high flow experimental releases and have the lead responsibility for measuring the physical and biological responses to these releases. USGS scientists studying sediment transport and geomorphology revised and adapted the theoretical understanding of sediment movement in the Colorado River. Since 2000, USGS scientists have developed innovative methods that greatly enhance our ability to track sediment movement in the Colorado River and measure sediment delivered to the river from downstream tributaries. The USGS program of continuous measurement of how much sand is available to be redistributed by an HFE is unprecedented in the scientific management of the rivers. USGS has worked cooperatively with Reclamation to design a high flow experiment that is most beneficial to the Colorado River ecosystem. Q: What can Grand Canyon National Park recreational users expect along the Colorado River during the high flow experimental release? A: Since 1996, releases from Glen Canyon Dam have averaged from 8,000 to 25,000 cubic feet per second. The increase to approximately 38,100 cfs will change conditions on the river during the duration of the high-flow event proposed for November 2018. For example, research has shown that some normally difficult rapids decrease in their technical difficulty, whereas other normally straightforward rapids become more technically challenging. At the same time, the volume of water at approximately 38,100 cfs will change the size and availability of campsites and these changes will occur at different times as the volume increases and moves downstream. All river and backcountry users should check the USGS Grand Canyon Monitoring and Research Center’s Web site at http://www.gcmrc.gov, Reclamation’s website at https://www.usbr.gov/uc/rm/gcdHFE/ or the Grand Canyon National Park website at https://www.nps.gov/grca/learn/nature/hfe.htm before starting their river or backcountry trip to be prepared for variable conditions including higher river flows. An interactive map of predicted shorelines during the high flow experimental release is provided by the USGS Grand Canyon Monitoring and Research Center and can be found here: http://usgs.maps.arcgis.com/apps/webappviewer/index.html?id=721001c63d91458883340f05c68c55f4. Q: Will the National Park Service allow motorized science or other administrative boat trips in the Grand Canyon during the HFE? A: Beginning in 2006, the National Park Service implemented a Colorado River Management Plan that includes a 6.5 month no-motors period from September 15 to April 1 each year. NPS has processed permits for a limited number of science river trips to occur during the HFE. The permitting process includes conducting a “minimum tool analysis” of proposed trips. The equipment used for the proposed sediment studies will require the use of motorized rafts during the HFE. Q: What other actions will Grand Canyon National Park take during the HFE? A: Grand Canyon river and backcountry permit holders affected by the higher flows have been contacted and informed as to the potential conditions they can expect during their visit. NPS staff will be available throughout the park, including at Lees Ferry and Phantom Ranch, to answer questions from permit holders. Posters showing the flow hydrograph and timing of flows as they move downstream will be available on the park website, at the Backcountry Permits Office, and posted at information kiosks at Lees Ferry and Phantom Ranch. Q: How could the high flow experimental release affect the Lees Ferry rainbow trout fishery? A: Data from monitoring rainbow trout in Glen Canyon following fall HFEs in 2012, 2013, 2014, and 2016 indicate these fall-timed events do not influence rainbow trout reproduction, movement, or survival and have no consistent effect on growth rates. Research indicates that factors other than HFEs may be driving rainbow trout dynamics in Glen Canyon. Q: How could the high flow experimental release affect brown trout in Glen Canyon? A: Recent increases in brown trout in Glen Canyon coincided with several fall HFEs. An evaluation of available information determined that the increase was due to a migratory event of adult brown trout in 2014 followed by successful reproduction of these fish in 2015 and 2016. Several potential causes of these events were identified including water temperature, rainbow trout density, frequency of fall HFEs, and brown trout density, however, no strong correlation signal exists in the data suggesting one cause is more likely than any other. Q: How will the high flow experimental release affect river recreation opportunities from Glen Canyon Dam down to Lees Ferry, including those opportunities at the Lees Ferry rainbow trout fishery? A: Wilderness Adventures is a concessionaire authorized to operate guided float trips for visitors on the Colorado River between the Glen Canyon Dam and Lees Ferry. These float trips will not occur during the HFE period between November 5 – 8, 2018. Back-hauling of kayaks/canoes/paddle boards upriver will also not be available. Fishing opportunities by commercial fishing guides will be curtailed during the short duration of the HFE release from November 5-8, 2018; however fishing opportunities before and after the HFE will not change. All services may be resumed after the HFE, depending on the commercial service. Q: How will visitor services at Glen Canyon National Recreation Area (Lake Powell) be affected by the high flow experimental release? A: The level of Lake Powell is expected to drop approximately seven inches over the course of the HFE, which begins with increased powerplant capacity releases on the morning of November 5 and returns to normal powerplant releases the afternoon of November 8. 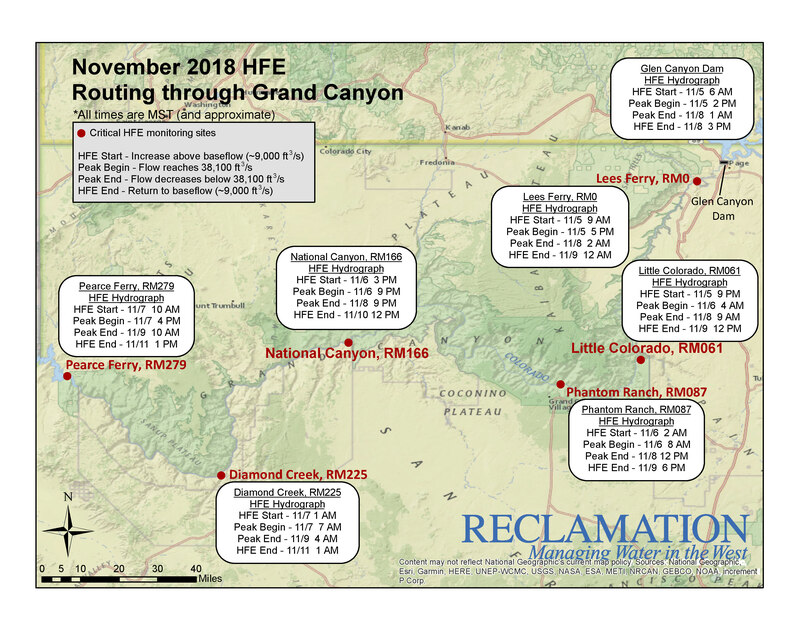 By the end of November, the elevation of Lake Powell will be 4 inches lower than had there been no HFE. There should be no significant disruptions to boaters or visitor services on Lake Powell as a result of the test flow. Q: What can Lake Mead National Recreation Area users expect along the river during the high flow experimental release? A: During the HFE, water along the Lake Mead river corridor from Pearce Ferry to South Cove will flow at higher volume and at a faster speed. Because releases will increase to approximately 38,100 cfs, boaters should use added caution when navigating this portion of the river during the experiment. Boaters may also notice additional driftwood and sediment, which could build up along take-out areas or be present in the river. The pipe mat at the Pearce Ferry takeout will be removed during the HFE. Therefore, the retrieval area will be more primitive. Throughout the rest of the lake, water elevations are expected to rise about 7 inches in a short period of time. Along the shorelines, visitors should be aware that with rising waters, beach camping equipment may become inundated, and unsecured boats may drift away. Likewise, when water levels recede, beached vessels may be left high, dry and stranded. As always, when boating on Lake Mead or the river, ensure you have appropriate life jackets for all passengers. A secondary communication source like a marine band radio is also recommended. If you find yourself in need of emergency assistance, use the radio or call 911. Q: When will the peak flow reach key locations on the Colorado River?